Monday -Thursday: 8:30 a.m. – 5:00 p.m.
For over one hundred years, F&M Bank has served the people and businesses of Page County. 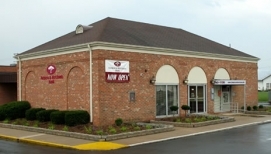 Our Luray branch is conveniently located in the East Luray shopping center, making it easy for you to combine your trip to the bank with other errands. As part of our commitment to supporting and investing in the local communities we serve, F&M Bank is proud to participate in Small Business Week’s “Go Local” campaign. We know that small businesses are the foundation of every thriving town, and Luray’s shops and other enterprises deserve recognition for their role in creating a vibrant place to live and work. Your local F&M Bank Branch in Luray is open six days a week with extended hours on Friday and drive-thru service on Saturday mornings. We also have an on-site ATM for cash withdrawals and other transactions when you don’t have time to come inside or need to bank after hours. Our friendly customer service team is here to help with all of your banking needs. Visit your local F&M Luray branch on Main Street. Vickie Young, Branch Specialist, and Yvette McCoy, Branch Coordinator, as well as the rest of the customer service team are ready to discuss your financial needs and goals and help you create personalized solutions. Stop by or call us today.